Abundant, sky-blue, phlox-like flowers all summer. Gorgeous clusters of pale, sky-blue flowers appear all summer long. Loves a hot, sunny spot - grow in pots, as they need moving to winter protection below 2C. Great colour for summer patios - a cool seaside colour is very much on trend. When grown in the flower border it will form a large, sprawling shrub. Supplied as established plants in 1.5L pot, ready to plant out. A superb summer patio plant, adding a tropical flavour to your garden or patio - their clear sky-blue flower clusters smother this informal, scrambling shrub, which works well in large pots with cane supports. Grow outside all summer, it will need winter protection, as can be damaged below 2C, but will regrow away from the base the following year when it warms up again. In warmer parts of the country, especially in sheltered towns, plumbago will grow as an herbaceous perennial, dying down to ground level before reshooting in late spring. The clusters of phlox-like flowers are subtly scented and will attract butterflies and hoverflies into your garden, making them a great plant for wildlife. 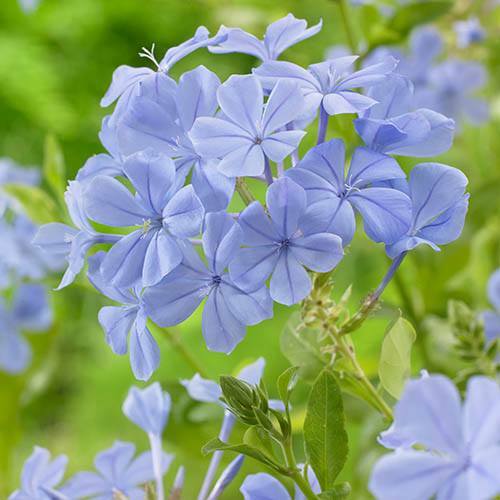 Also known by its common name of Cape Leadwort, Plumbago is named from the Latin word plumbum, meaning lead, as it was believed to be a cure for lead poisoning. A great colour addition for summer long colour, and unusual too as it is seldom offered for sale. Supplied as an established plant in a 1.5L pot, ready to pot on. Plant into a large decorative container for best effect so that it can be moved under cover in winter. Grow in pots or a sheltered area of the garden - it prefers slightly acidic soil and is fairly drought-resistant once established. A good pruning will result in lots of new growth, and, as the flowers appear on new growth you can expect a better display.